Whether you're a kid, accompanying one or neither of the two, there are still lots of reasons to catch Despicable Me 3 in the theatres, says Sukanya Verma. Gru and gang are at it again. Usually I'd say that with a lot of trepidation -- franchise wary as I am, week after week enduring an onslaught of rotten sequels and reboots. But it's a relief to report that this lively animation (reuniting the director duo Pierre Coffin and Chris Renaud along with screenwriters Ken Daurio and Cinco Paul) still packs plenty of bang for its buck. Gru, the surly supervillain turned Anti-Villain League agent with a nose that could put a toucan to shame, learns he has a twin brother, Dru. Together the monochrome-clad brothers bond over their father's legacy and a renewed passion for mischief. Despite the deja vu feels of this track, Steve Carrell's ingenuity in playing off the two siblings and their uniquely European accents gives their differences an agreeability that stays clear of melodrama. Sporting a purple body suit with shoulder pads, mullet hair and funky moustache, not only is Balthazar Bratt (Trey Parker) the most outlandish looking antagonist of the series, he's the most amusing too. An erstwhile child star taking to real-life villainy after puberty hits him at its most unkind and the network cancels his show, Bratt is still bitter about the episode and deploys all kinds of retro devices to wreak havoc. Michael Jackson looms large in his inspirations as moonwalks to Bad, hurls a yo-yo to break a vault, chews incessant quantities of 'super sticky, self-inflating gum' and ensures every antic is accompanied with classic chart toppers by the likes of A-ha and Madonna. It's not just the soundtrack that's buzzing with retro love, but Bratt's delicious, disturbing regard for nostalgia is evident in his gadgetry that uses everything from a robot to Rubik's cube or revisiting reruns of his star-making show. Why the Minions, of course! Gru's army of cheerful, chirpy yellow complexioned handymen spend a good deal of their screen time away from the boss, doing their own independent gig. It's a parallel track that has little to do with the central plot, but watching the cutest mainstay of this franchise explore their untapped songster potential or plan one of the most imaginative prison breaks is too much of a hoot to complain. Gru's adopted brood of Margot, Edith and Agnes amp up the adorability quotient adequately. Whether it's to surprise their parents with a concoction of meat and gummy bear soup or discovering a thing or two about moms, boys and goats -- although Edith is somewhat short-changed -- the cutie patootie trio keeps the 'awws' coming. Despicable Me 3's bouncy, breathless inflow of droll action is designed to keep the younger members of its audience with very little attention span engrossed till the end. At 90 minutes, its energy is much too zany and vibrant, peppered with enough imagination, to exhaust. Bubble gum pink, Cadbury purple and every other hue of candy boldly splashes itself before the screen lending the proceedings a joyous, effervescent soul that's a treat to behold, 3D or no 3D. The twins trope, an 1980s has-been star, a mother becoming more confident about her parenting skills and kids discovering not everything they believe is real, there's predictability to these arcs. The writers realise this and treat their quandaries and environment with a shrewd mix of sentiment and parody. Despicable Me 3 goes wild with its comic creativity, throwing uproarious imagery of everything from a Sistine Chapel ceiling featuring pigs to a disco ball-aided diamond robbery to Minions gate-crashing Hollywood studios, life around these guys is all very hectic and hilarious. Despicable Me has enough soul in its heart, substance in its artistry and spring in its step to try and subvert the formula just yet. Although the climax feels bloated and has the appearance of a superhero blockbuster template, it never loses sight of its fun-filled essence. Its prospects in the sequel business are strong as ever. 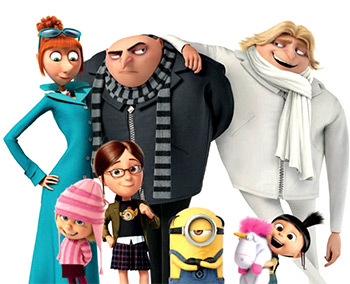 Just like those fun, fast and furious re-runs Bratt never gets tired of, it's easy to warm up to the feel-good fervour of Gru and his ever expanding family every single time.